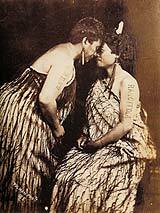 These two ladies of unknown tribal affiliation both have tattoos on their arms. This type of tattooing is thought to have originated with the missionaries permanently marking their early converts. Circa 1880s. Collection of Mark and Carolyn Blackburn.